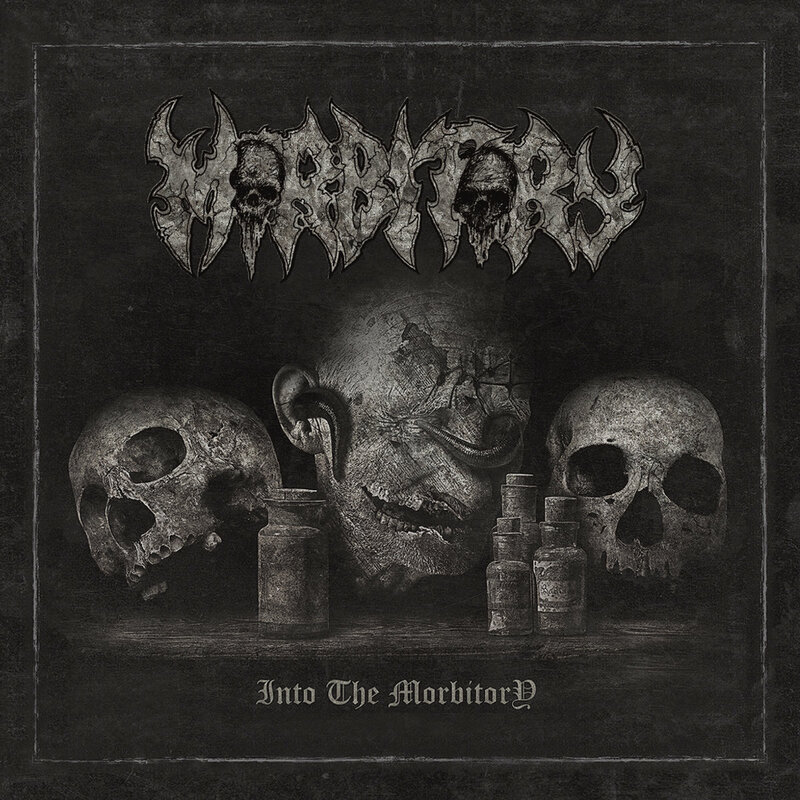 Home » » Interview - MORBITORY - In general I think horror, splatter and blasphemy are good themes. Interview - MORBITORY - In general I think horror, splatter and blasphemy are good themes. 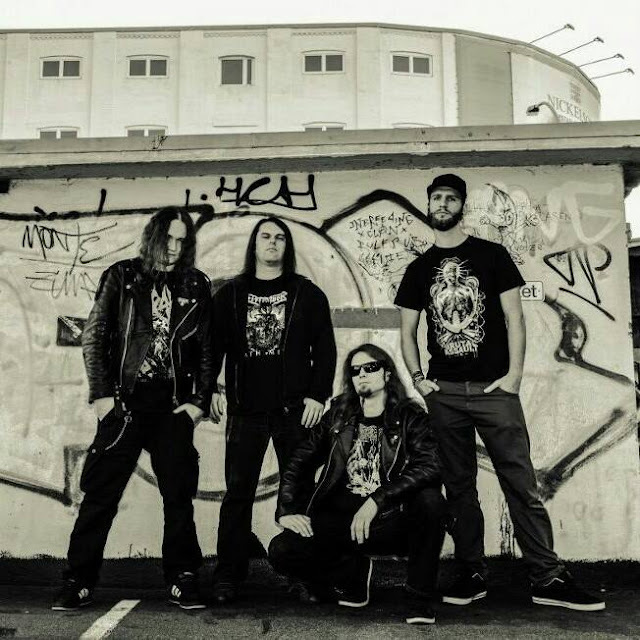 Interview with death metal band from Germany - MORBITORY. Translated and questions prepared by Duzl, thank you! Morbitory was formed in Hamburg in 2013. Let's talk about the band a little bit deeper. How did you get together? Who invented the name of the band, who is the author of your logo and why did you decide to play death metal? Our shouter Angelgrinder and me were visiting the same concerts and music pubs, so that's were we met. We played a gig together with our bands Dawn of Obliteration and Rotten Corpse. We both didn't feel fulfilled and were excited to start something additional together. Rightaway we had the idea to ask Michael. We already knew each other well, as we both play together in Dawn of Obliteration and he felt the same way. Henning, our drummer was recommended to us by a friend and it turned out to be a perfect match. It straight off worked out very good together. I had the idea for the band's name while drinking beer (of course, hahaha) at a friend's place. The logo was made by Lutz, a tough pal, who has a great talent for such things. Well and no question, that we decided to play Death Metal! What else? I can explain that to you from my view. What led you to become a musician and start playing in bands? Did any particular bands inspire or influence you in those early days? What were your music goals when you forming Morbitory or Down of Obliteration? I started listening to Death metal in the early 90s. I went through various metal classics and got into Death Metal kind of fast. I bought myself a bass guitar and always wanted to play in a band since then. I was influenced by the big Death Metal bands at that time, such as Morbid Angel, Death, Pungent Stench, Entombed/Nicke Andersson, Carnage/Dismenber, Deicide, Autopsy, Bolt Thrower, Possessed, Grave and Unleashed, just to mention a few of them. Those were the golden days, a lot of real great albums were released. I still was kind of young back then, so I didn't know or understand everything yet, but that's when my passion for it started. At that time I also started first attempts to play in bands. Because of a lack of other musicians in my home town and some health problems those projects didn't last very long. It took until 2010 until things started to work out better, so I became active in making music again then. Both bands are focused on keeping the old school, less technical Death Metal alive. Dawn of Obliteration are more concentrated on a dragging groovy style, whereas Morbitory also have faster parts. All people in both bands are already experienced in playing music since a longer time and also attend other bands. It's about the spirit, the bandfeeling. Everyone takes part and brings in influences, that's what constitutes us. Besides Morbitory, you have another band with Michael - Down of Obliteration. So I wonder if Morbitory original idea was to be a side project or was it clear that it would become the main band? As I already mentioned, Dawn of Obliteration already have existed before. We just felt like doing more and things turned out the way they are now. Both bands have the same importance to me. Morbitory is more active than Dawn of Obliteration, but there are also some reasons for that fact. 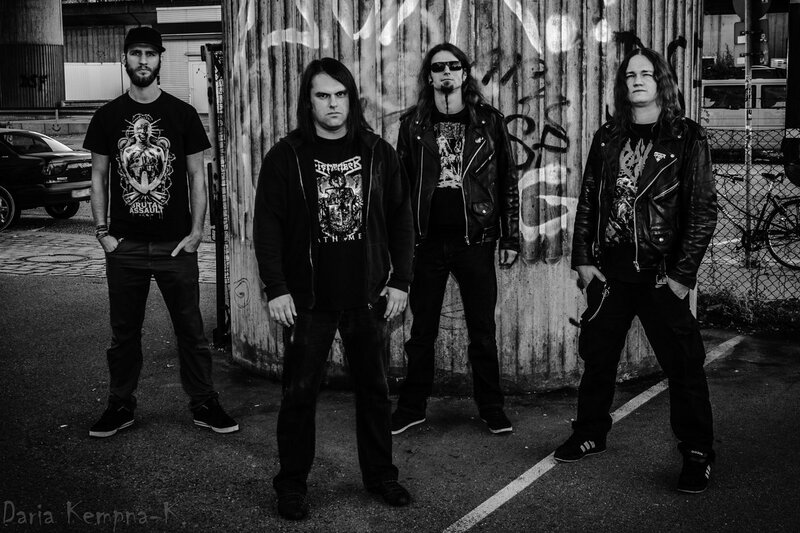 With Morbitory, you play relatively big events like the recently sold out gig of Obituary in Berlin or Napalm Death in Hamburg. How do you perceive this? A lot of bands are working hard for years and never get so far. And what's about the feelings of standing on stage along your patterns? Yes, wow, with a lot of respect and enthusiasm. That's not usual and we really appreciate it. Those were some particular gigs, but we still are an underground Death Metal band, that enjoys playing and partying anywhere. Your first EP from 2016 titled "Into the Morbitory" is an excellent record! This album has a really good reviews. What was the inspiration? Were you recording this album? Who is responsible for the sound, mastering and production? Can you get us through this album and tell us a little bit about the concept? I really like an old rotten dirty sound of these records! How satisfied are you with this record? „Děkuji moc!“ The inspiration simply was, that we all got on very well together an all had the same visions. We wanted to make up some songs fastly to get to play them live. Some riffs actually are very old ideas. As we were focussed on playing live, we first thougt about starting with a simple demo, but then it appeared to become more. As we only have one guitar, we decided to emphasize the dirstorted bass guitar and rather use the sound like a rhythm guitar. We wanted to create a cleaner sound, but without giving up the old roots. We recorded the album at three studios in Hamburg. I'm very satisfied with our debut. Sure afterwards there always are a few things, you could have done better, but that's how it is. I think the other bandmembers agree. For those who have not read your lyrics, can you mention the themes that you deal with? Who is a author of the lyrics and what inspires you to write and what role does literature have? I can't tell you very much about that. The titles of the songs kind of have importance to me. As long as they sound good to me, I'm fine with it. In general I think horror, splatter and blasphemy are good themes. I don't need politics in Death Metal lyrics, but to say it clear, definitely no racism, facism or nationalism! After 5 years of existence Morbitory you don’t have a full length album yet, what was a reason to release just an EP ? Lack of material, money, time ….or something different? When we can expect the new album? Yes, I think somehow all of those reasons came together in a way.Since Into the Morbitory we have made a couple of new songs, which already are part of our live set. We keep working on new material. Good things take some time. Be surprised. I assume that you are also a listener of music. Your band has a bandcamp, are you supporters of various streaming services, or do you prefer physical medium? Do you collect CDs, vinyls , tapes etc.? What's your most valuable album in your collections and you are proud you have it? Sure, we use new media options for the band and also in private. The number of interesting bands is growing all the time and it's a good way to spread your music and make people recognize you. Some of them will attend your concerts, support you there and maybe even buy some merch or a record then. For myself I still prefer vinyl, that's how I started discovering metal. I can tell you some particular things about every old record I own. Every record goes along with a story. You still know, where and at which price you've bought it, how you made it to afford the money for it and what value it has now... My collection isn't oversized, but there are some cool albums within. I'm annoyed about the prices and the false arguments of the record labels nowadays. That for we've got the Underground! How do you see the evolution of german metal scene over the years? Do you keep contact with some other German bands? Is some „new blood“in the German death metal scene which you like recommend to us? Well, the big music industry has already started to take hold on metal music some time ago. When you take a look at the charts, you can see, that it even takes part in and begins to influence the development of extreme music. There are events and festivals for all different styles of music nowadays. Some metal festivals are so big, that they seem more like a public happening than like a music festival. But at the same time the hard times for death and thrash metal are over aswell. Since a couple of years, there a new young bands, who have dicscovered this music for themselves and take part in bringing it on. That's why every Death Metal genre will persist. It's the same with vinyl. After a fall there's a comeback for a certain group of people, who keep interested, and that always remains. 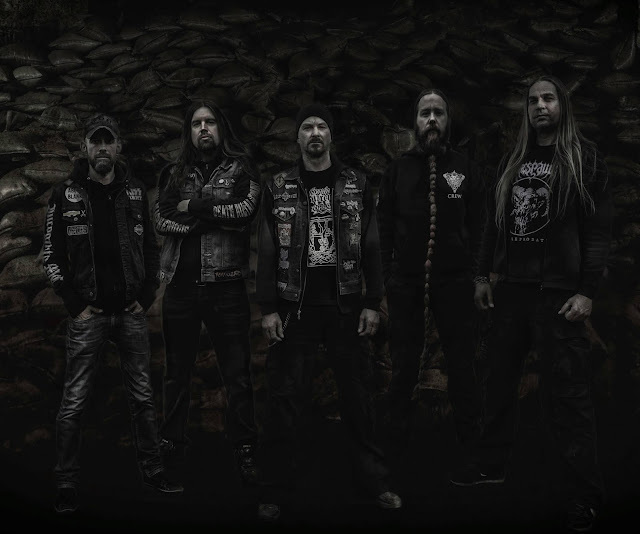 Concerning Death Metal, on the one hand the undergrond scene keeps growing with more and more bands, on the other, a lot of old Death Metal bands have found their way back to the roots and did a great comeback. That makes up a nice mixture, which will keep Death Metal alive. Sure we meet other bands at the gigs and stay in touch with some of them. Hamburg has a nice metal scene with great bands like Devastator, Sufferage, Irate Architect, Gorezone, Ophis, Gustav Eisen, Endseeker, Serpents Gift, Incarceration, Thrashing Pumpguns, Exit Smashed and Detraktor, just to mention some of them. You are from Hamburg and I am really big fan of St. Pauli football team, so I must to ask you which team do you support? Do you see some connection between Football and music culture? I'm not a big football fan, but I'm always up to date. St. Pauli really is a unique team, some of my friends attend all of the games. Music and football surely have a connection, you can feel that in the stadion and the pubs, but it's not mainly metal music, they play there. Well, there are some exceptions like Tankard, but they play beer-drinking-thrash-metal, haha, I like them. Can you tell me what to expect from Morbitory in the Future? Some plans and visions? When are you coming to play in Czech Republic? I'm looking forward to lots of gigs and festivals, I hope we will be able to play some gigs abroad aswell. It would be a pleasure to play in the Czech Republic. And we are also working on a new album. A bit „ tricky „ question in the end - we are sharing a borders, so how many bands from Czech Republic do you know? Well, there are Krabathor, Orthodox is on my top list, a great album!... then Hypnos of course... Gutalax... Fleshless and Malignant Tumor, we've played with both of them at Swamp Fest in Berlin, Malignant Tumor are great pals... Masters Hammer, a classic... and certainly Master, hahaha. Thank you for your time and answers Myers! I really appreciate it and I wish you a lot of success on the metal scene at home and abroad, hope to see you soon somewhere on the stage and the last words are yours… „Prost“! Thx for the Interview and supporting Morbitory and the German Underground, Duzl.